Kennel Bernerhaugen is situated in Bærum near by Oslo. 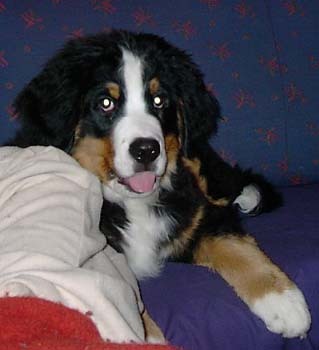 Berner sennen have been a part of our life since 1983. Seven dogs have been family members during the last 21 years - 3 lovely females and four good males. To day our 2 1/2 year female Shika and 1 year Ozzy are living with us as fully family members. 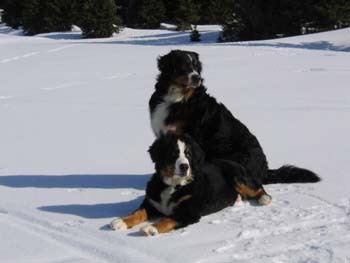 Our dogs are our berner children and of course they live inside with the family. Every evening Ozzy is standing in the door - looking for mamma - are you coming, I want to go to bed. We are active within one of the local divisions of the official BMD in Norway. For the time beeing Terje is editor of the local club paper and webmaster of the official homepage. Dog Shows has not been the top priority during the years - with four active children - but the dogs has allways been joining us at the childrens activities. But now the children are older, and we have the time for Dog Shows. Hoping to take them to shows in Norden and Europe. We might also have more litter of puppies in the future. Worth to take care of?